Students and faculty from across Kellogg Community College’s Choral Arts area will lead their audience on a musical journey this month during the College’s annual “Singing in the Spring” concert. 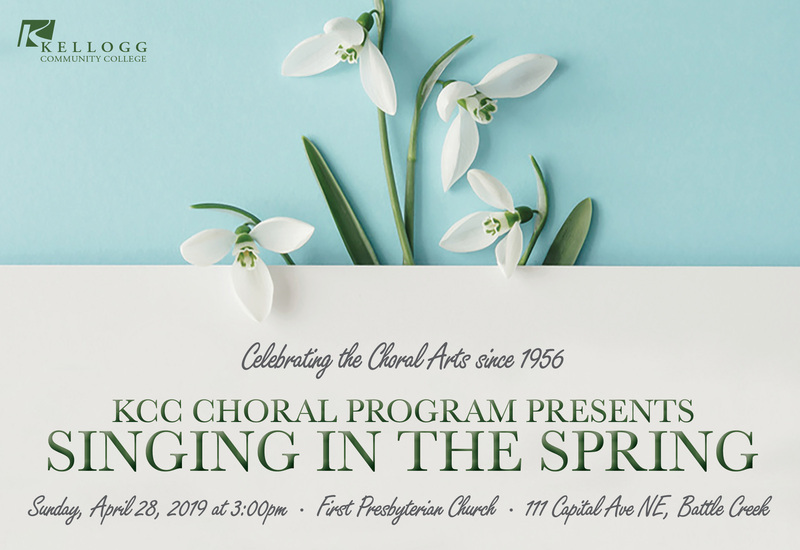 The concert program includes a selection of group and solo performances of classical and popular compositions, and will begin at 3 p.m. Sunday, April 28, at First Presbyterian Church, 111 Capital Ave. N.E., Battle Creek. While admission is a freewill donation, the concert does serve as the official fundraising kickoff for the program’s 2020 Canadian Concert Tour. A cookie reception will immediately follow the performance. Dr. Gerald Case-Blanchard, KCC Music Program coordinator and director of the College’s choirs and vocal arts area, said the concert offers something for everyone, and audiences will not leave disappointed. In addition to the choral works, there will be solo performances by KCC organ music professor Katharine Cary and music professor Charles Timmon West II. Soloists will include KCC voice faculty soprano Betty Picard and tenor Dr. Mark Wells. In addition to faculty, KCC alumna mezzo-soprano Jackie King and guest baritone soloist Joel Snyder will also join the chorus. KCC music faculty member Nancy Brown will accompany the chorus and soloists on the church’s 1928 57-rank Dobson/Skinner organ and on its 7-foot Mason & Hamlin grand piano. For more information about KCC choirs and other KCC music initiatives, including opportunities to study music at KCC, contact the College’s Arts and Communication offices at 269-565-7859 or visit www.kellogg.edu/music. Case-Blanchard is available for comment and can be reached at 269-565-7859 or at blanchardg@kellogg.edu. KCC’s Arts and Communication Department offers a robust Music Program including an Associate of Arts degree with a Music concentration and certificates in Music Enrichment and Sacred Music. Additional music opportunities for students and community members offered through the College include individualized voice and instrument lessons, master classes, student recitals, an annual Opera Workshop and other music initiatives, including youth performance camps. The College also host three residential choirs, including the Branch County Community Chorus, the Concentus Vocal Ensemble and the Kellogg Singers, which perform together as the KCC Choral Union. In addition to performing regularly in its home state of Michigan, the Choral Union has performed nationally at major venues in Illinois, Indiana, Minnesota, Massachusetts, New York, Ohio, Pennsylvania and Wisconsin, and performed international concert tours of Ireland and Italy in 2012 and 2014, respectively. KCC choirs have opened for several internationally renowned musicians, including Grammy Award-winning musical groups Take 6 and Sweet Honey in the Rock, and regularly collaborate with major musical organizations including the Battle Creek Symphony Orchestra, the Haydn Festival Orchestra, the Monroe Community Chorale and Symphony and the Sacred Music Festival of Kalamazoo.